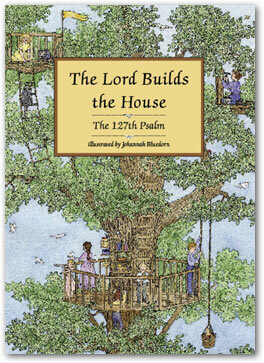 In Johannah Bluedorn’s rich vision, each verse of the Psalm is illustrated with a portrait of “sumptuous simplicity”: farm and wild animals celebrate the bounty of nature; the beauty of family; the achievements of builders, bakers, and book authors; and the miracle of God’s protection. The book makes the Psalm accessible to very young children, and reminds adults of God’s provision for animals as well as for His people. About the author/illustrator: Johannah Bluedorn has been homeschooled all her life and is self-taught in art. Skilled in the use of a variety of media, Johannah has illustrated several other children’s books, including Alphabet for Biblical Hebrew, Alphabet for Biblical Greek, Become a Civil War Re-enactor, My Mommy My Teacher, and the forthcoming book From Dark to Dawn: A Tale of Martin Luther and the Reformation (published by Books on the Path). In her spare time, she designs and sews costumes and raises Jersey cows. Johannah lives with her family in New Boston, Illinois.